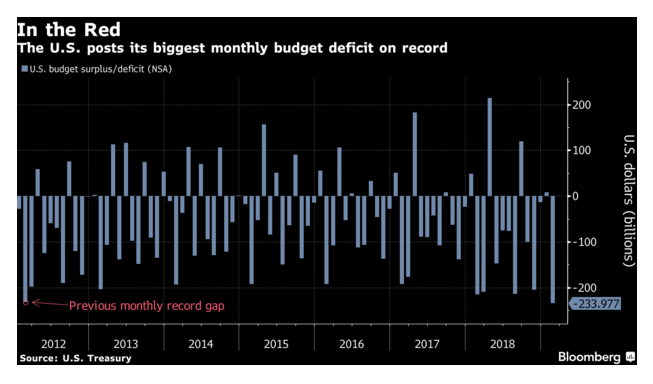 The U.S. posted its single biggest monthly budget deficit ever recorded during February amid falling corporate and individual tax revenue, and increased federal spending. The budget deficit hit a record $234 billion in February, steamrolling right past the projected $227 billion deficit — and $20 billion higher than the previous record high of $232 billion set in February of 2012, the last time the deficit for the year topped $1 trillion. The month of February is typically when the deficit is highest due to tax returns being paid out. The budget deficit has ballooned to $544.2 billion for the fiscal year, a staggering 39 percent higher than the $391 billion shortfall the same period last year. The deficit is ballooning largely because of decreased revenue after the passing of the Tax Cuts and Jobs Act, which slashed corporate tax rates from 35 percent to 21 percent while also lowering the individual tax burden for most citizens. The Trump administration’s budget sent to Congress last week projects this year’s deficit will be $1.09 trillion and will remain above $1 trillion for the next four years. The administration’s 2019 forecast is a 40 percent increase from last year’s deficit of $779 billion. Due to rising interest rates throughout 2018, interest payments on the national debt topped $221 billion. The Treasury estimates interest on U.S. public debt is on track to reach a record $591 billion this fiscal year — more than the entire budget deficit in fiscal years 2014 and 2015. Of course, no one in Washington seems to care at the moment. Federal Reserve Chairman Jerome Powell reiterated his concern over the government deficit in a press conference Wednesday, saying that the nation’s growing debt pile needs to be addressed. At the same time, there’s a shift among some economists — led by proponents of Modern Monetary Theory — on the dangers of a growing deficit, with low inflation and cheap borrowing costs suggesting there’s room for additional spending.